One of the best ways to enhance the effectiveness of your chainsaw is to change the chain often. This process can become expensive especially if your backyard has a lot of trees. The good news is you don’t have to run down to the hardware store to purchase a chain every time it dulls, there’s a better way. The most efficient way manage chains is to reuse them. With a little sharpening, they’ll be as good as new. We’re going to walk you through our selection of the best electric chainsaw sharpeners. We’ll talk about the pros and cons of each and the knowledge you’ll need to purchase the one right for you. mount to a wall for versatility which is what makes this the best choice for the consumer. 1. 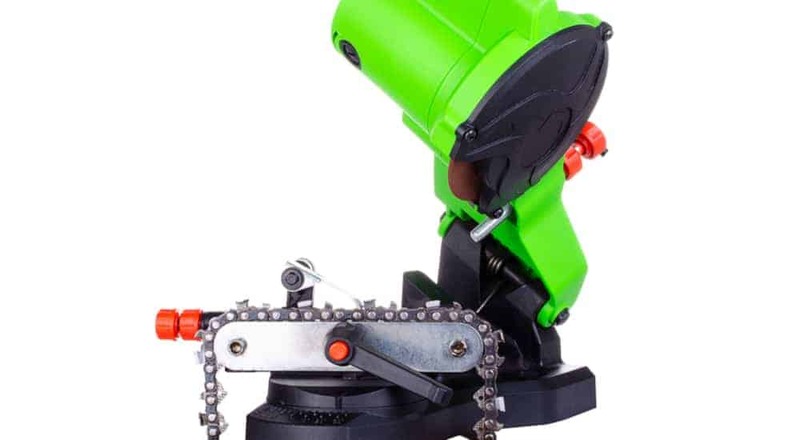 Our Pick: Oregon 410-120 Bench or Wall Mounted Saw Chain Grinder1. The Oregon chainsaw grinder comes with dual mounting capability. You have the option to mount it on a wall to save table space or mount it on a work table if preferred. The sharpening wheel has the ability to vary up to .404 pitch giving you quality control during operation. This model is easy to use and is designed to accommodate any adjustments you need to make while operating. The Oregon model includes three grinding wheels for sharpening. Additionally, it comes with a dressing brick and a quick template to provide more value. This machine is a single-phase direct drive, with one way 120v motor, which is an added safety feature. The motor runs up to 3500 RPMs to give you the power needed to get the job done right. Oregon tools come with a troubleshooting guide to help you fix any problems that might occur. The sharpening is also under warranty and has live customer service available during business hours. The Oregon 410-210 comes with a detailed owner’s manual giving you the ins and outs of your machine. In case you’re working in a low-lit garage this model comes with a built-in light to illuminate your workspace. This sharpener comes with a longer nose and has strong performance due to the news sprocket nose system. The CO-Z model is equipped with a 230w motor which provides 3000 RPMs. Ready for any projects coming your way. The built-in work light makes sure you have enough light to help you focus on executing a safe an accurate sharpen every time. The extra thick helps you prevent foreseeable splashing iron fillings. Additionally, the aluminum casing helps with that as well. The chain grinding angle can be adjusted from 0 to 30 degrees, while the motor can be adjusted from 0 to 70 degrees. The CO-Z sharpener comes with scales to provide you a precise effort during every use. This model is dual mounting, which means you have the luxury of placing this machine on your work table or your wall. This deal also comes with two additional grinding wheels, and 1x4mm and 5 mm wrenches. CO-Z also provides an owner’s manual with detailed assembly instructions and maintenance guidance. This sharpener comes with a disc guard to protect you during operation. This model provides a guide plate to help with a precise sharpen. Additionally, it provides an easy to use rotating table and guide adjustment knob. One of the best safety measures is the chain stop. This will help prevent you from accidents that could occur. The premium model gives the consumer a perfect mixture of quality and ease of use. Designed to provide high-quality results at a more affordable price point. The grinding wheel comes with an adjustable setting, giving you a flexible machine. With the indexing chain stop feature, you can gain more control of the machine while operating. It also comes with a longer, self-centered forward sliding vise. The Oregon model comes in stock with a built-in light to illuminate dark work spaces. Additionally, this provides an added safety feature. This model package includes three grinding wheels for sharpening use, and a pitch chain and depth gauge as well as a dressing brick and a template. The chain operates up to a .404 inch pitch standard. You can purchase a modifier to work up to a ¾ inch pitch on the machine. This model has a single phase, direct drive motor, which means it only operates in one direction. This is a nice safety touch. The Oregon also comes with a motor-head release button. The model operates with powerful speed up to 3400 RPM. The Buffalo electric chainsaw sharpening has the benefit of mounting to a wall or work table which can help you save some work table space. With the incredible speed of 4200 RPMs, this is the fastest of the chainsaw sharpener we’ve listed above. This model adjusts to all chain designs which gives you an incredible amount of flexibility. This sharpener comes with a detailed owner’s manual to help you assemble and know the ins and outs of the machine. Additionally, Buffalo offers a 90-day warranty on the machine in case of any malfunctions that occur on. There is also a support line available during business hours of operation which you can call into with any concerns. The Buffalo model comes with a 4-1/4-Inch x 1/8-Inch grinding wheel with 7/8-Inch arbor. Includes: 3 grinding wheels sizes 1/8", 3/16", 1/4"
Timber Tuff brand is the leading forestry equipment brand on the market. You can have confidence that this machine will operate to your satisfactory. This sharpener has incredible speed and with 3600 RPMs it’s the fastest sharpener we’ve selected. It comes in stock with 3 grinding wheels; 1/8-inch, 3/16 inch, ¼ inch. A work light comes on board providing you with enough light you need to work In low-lit areas. The Timber Tuff securely mounts to most surfaces provide a sturdy sharpening station. This model has a powerful 230-watt motor giving you enough power to complete any sharpening job in front of you. This sharpener is designed to sharpen chains varying in the range of ¼ inch to ¾ inch. It comes equipped with simple adjustment guides your sharpening. The Timber tuff has a safety shield to protecting your eyes from any sparks or projectiles. This model us comes with a unique thermo load protector for your safety. ​If you find yourself working with timber often and using a chainsaw, the electric chainsaw sharpener is a must. Instead of running down to the hardware store every time your chain dulls you can sharpen and reuse your chains. There’s no need to resort to dates hand sharpening methods when various models have become affordable. What we’ll discuss is the dynamics of the machine and what to look for when purchasing one. This machine is designed similar to an adjustable speed bench grinder however there are some key differences that make the sharpener unique. The chainsaw sharpener was designed for a more intricate sharpening process. Grinding Wheel: Grinding wheels come in various sizes depending on the need of the operator. The wheel is encased with a guard and powered by the motor. The grinding wheel is used to sharpen the chain. Chain Vise: The chain vise is where you place your chainsaw chain for it to be sharpened. It will sit below the wheel on the platform of the machine. Mount: Sharpeners can come with dual mounting capabilities. If you wish to save workspace the machine provides a wall mounting system or a table mount. Some models don’t provide this luxury which is something to keep in mind. Choosing the right electric chainsaw sharpener can be subjective. Every user will have different buying motives that fluctuate based on their needs. However, here are some things to consider which might help you decide. Examine what type of chain sizes your chainsaws have. Not all sharpeners accommodate every chain size most have ranges they’ll accept. The reason being is the chain needs to fit snug in the vice while being sharpened. Make sure you choose a model that will accept your chain sizes. Having the option to choose where to place your machine can be a major benefit. If your worktable is already cluttered with power tools, consider a model that provides a wall mounting option. One thing to consider is the accessories which come along with the model. For example, not all models will come in with a built-in lamp. Others come with dials to read angles while others don’t. Read through the list of accessories that come stock and find out what you need. Depending on the machine the price can be steep. Having a strong warranty is a wise move to ensure that your investment stays safe. Standard warranties run 90 days and have customer support lines. When you’ve found the right electric chainsaw sharpener for your needs it’s important to operate it correctly. One of the first things you’ll need to do is assemble the machine. Each machine should come with an owner’s manual highlighting the assembly process. Make sure your assembly as instructed and mount appropriately. Once assembled select the right grinding wheel size. Most machines come with wheels in stock, use these as a guide to which wheels to buy to restock. Typically, there are only two sizes of wheels accommodating for the chain styles, “cutters and shakers”. These are small blades that make the chainsaw cut, some people refer to them as teeth. With the correct grinding wheel size, you’ll want to angle the wheel. This allows the wheel to reach the cutters at an appropriate angle. Make sure you know the pitch of your chain. If you don’t know you can look it up based on the model you have. Once the wheel is angled correctly, place your chain into the vice. Depending on the model the vice will look slightly different. Make sure the chain is fastened in the vice to prevent kickback. At this point, you should be ready to sharpen. ​Before you began to operate the machine, you ought to read the Owner’s manual. In it our some of the best safety practices. Safety is the number one priority and with a brief review of best practices, you can save yourself from a preventable accident. When operating the electric chainsaw sharpener keep bystanders or children away. Additionally, keep pets away to avoid any unexpected interference while operating. Wear the appropriate safety gear. Never wear loose clothing, bracelets, necklace or any other jewelry that could get caught into the machine. Always wear safety glasses and gloves. Wearing protective gear can help prevent unnecessary accidents while the machine is in use. A helpful tip is sunglasses are not safety glasses, be sure to have some on hand. Never stop the wheel with your hand. When providing care to the machine always disconnect from the power source. Additionally, disconnect if you’re attempting to transport. Do not tamper with the stock guards. These guards are there for your protection and should not be modified or removed. For good measure remove any wrenches or adjusting tools from the machine before operating. When operating tool never force it. Applying stress to an oscillating machine is never a good idea and can enhance the risk or injury to you and the tool. Before you connect your tool to an outlet be sure the power switch is in the off position. To prevent any accidental falls or slips, keep your work area clean. Keeping up with proper care of your machine will ensure a long-lasting life and a quality sharpening. We’ve listed some checkpoints you can cover to keep up with your machine. After every use clear the work area of any leftover shavings. If you forget this simple step you’ll have a pile of shavings begin to clog up your machine. When operating the sharpener do not use force. If you find that it’s taking longer to sharpen it’s time to change out the grinding wheels. Unplug machine when not in use. This will help any shortages that might occur from unforeseen outages and prevent unattended starts. If you need to store or transport the machine for any reason place in the original box. If you don’t have the original box, find one of similar size. ​Q: How often should I sharpen? A: There is not a set number of times of use to signal a time for sharpening. The general rule of thumb is if you have to apply pressure while cutting it’s time for a touch-up. Q: How to use an electric chainsaw sharpener? A: The process can be accomplished in a few easy steps. As we mentioned above in detail; the steps are in order; assemble, adjust wheel, fasten vice, and sharpen. Q: How do I know what size chain I have? A: The size of the chain can be found in your owner’s manual. If you don’t have the owner’s manual you can check with the manufacturer and they usually have one on their website. Q: When should I change out my grinding wheels? A: There is not a set number of uses to measure this by. Generally, when you have to apply pressure to sharpen is the time to change the wheel. Q: How do I know what angle to set my wheel at? A: The angle of the grinder wheel is based on what type of chain you have. See owner’s manual of the chainsaw to find out what type of chain you have. The Oregon 410-120 Bench or Wall Mounted Saw Chain Grinder is our top choice for a variety of reasons. The machine comes with a sprocket nosed system which gives you a more precise sharpening. The built-in light is a nice touch to give you more visibility when operating. The Oregon is also backed with dual mounting options giving you the luxury of saving space in your garage. The CO-Z Electric Chainsaw Sharpener is a perfect choice if you desire quality but don’t want to break the bank. It has a 230w motor which provides plenty of power for every use. It comes with a built-in chain stop for added safety features. Additionally, It provides an easy to use dial system. For a premium pick choose the Oregon 520-120 Bench Saw Chain Grinder. It comes with an indexing chain stop and a motor head release system. Furthermore, like it’s counterpart it also comes with a built-in light system to provide extra light to your workspace.